I am pretty much obsessed with the New York design team Diamond and Baratta. 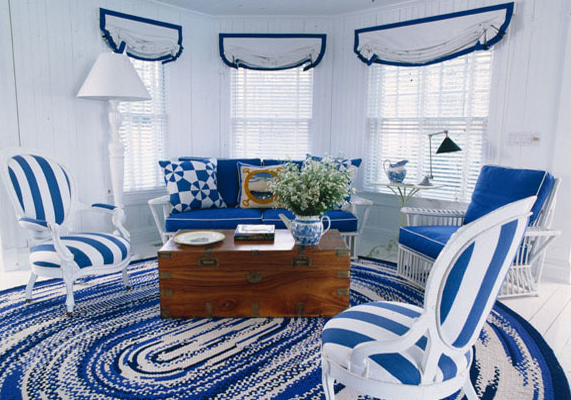 Their bold style, whimsical exuberance, and use of pattern are remarkable, whether they are working on a Miami apartment, a Hamptons cottage, or a Western ranch. From rugs to wallpaper, pillows to fabrics, their spaces incorporate so many geometric patterns, stripes, and other repeats. Most of the design elements are designed by the duo and custom made by artisans for each of projects, so you can't really buy this stuff anywhere (unless you hire Diamond and Baratta!) but if you are interested in patterns and how to use them in a space, look these guys up -- their portfolio is the best lesson book in how to do it. A few photos from their website are below, but check more out here. Truly inspirational!